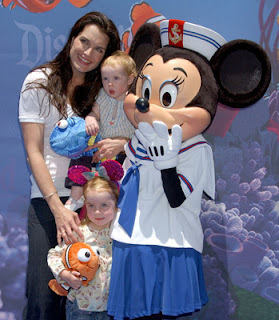 Many celebrities and their babies attended the Finding Nemo Submarine Voyage Opening in Anaheim California yesterday. The ride opens to the public today and it will surely be another big hit for Disney. Submarines will once again be submerged in the sparkling waters of the Tomorrowland Lagoon where you become an undersea explorer, discovering colorful reefs, ancient ruins, and an erupting volcano! Plus, you’ll come face-to-fin with Dory, Marlin, Bruce the Shark and other characters from the hit movie. It’s a “must sea” attraction!